Offering you a complete choice of products which include tinospora cordifolia extraxct. Guduci is one of the most versatile rejuvenative herbs. It works on all the tissue elements in the body. The Sanskrit name guduci means the one, which protects the body. It is also called as amrta or nectar, as it is extremely useful in strengthening the immune system of the body and keeping the functions of its various organs in harmony. It possesses various synonyms like jvaranasi febrifuge, vayastha – promotes longevity, rasayan- a rejuvenative, tikta – bitter etc. Maharsi Caraka has categorized it as stanya sodhana – relieve burning sensation of the skin, trptighna – anti saturative, vayah sthapana – promote longevity and as medhya nervine tonic. Susurta has mentioned it as sukra sodhana – purifier. Sarngadhara has classified it as samsamana – pacifier and rasayana – a rejuvenator. Internally, guduci is one of the most effective rasayanas- rejuvenatives. It works well on all the seven dhatus tissues and keeps the systems in balance. The rasayana accords longevity, enhances memory, improves health, and bestows youth, betters complexion, voice, energy and luster of the skin. In the diseases due to vata dosa it is given with ghrta, in pitta dosa with sugar and kapha dosa with honey. It is immensely helpful in the digestive ailments like hyperacidity, colitis, worm infestations, and loss of appetite, abdominal pain, excessive thirst, vomiting and liver disorders like hepatitis. 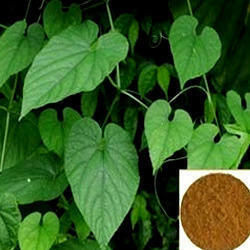 Looking for “Tinospora Cordifolia Extraxcts”?